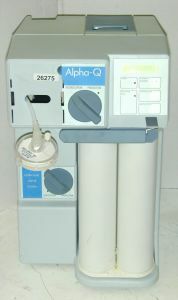 Product Description The Alpha-Q system is a compact water purification system designed to produce moderate quantities of ultra-pure water direct from a municipal tap water supply. Directly fed by tap water, the Alpha-Q system produces water which is pure enough for critical applications in the analytical laboratory, such as atomic absorbtion (AA), spectophotometry, HPLC, TOC and ion chromatography (IC). The Alpha-Q is a dedicated single-user system for production of up to 0.5 L/min of ultrapure water without the need for pretreatment. This is achieved by integrating an ultrafiltration cartridge (not included) for the pretreatment of feed water into the system. Any used filter cartridges, if present, are included AS IS (not tested, not guaranteed).